Researchers from Helmholtz-Zentrum Berlin managed to develop a robust and reliable magnetization switching process using domain wall displacement - without any applied field. This could lead to highly efficient spintronics memory devices. A spintronics memory design that uses tiny rings to enable two stable magnetization states - but the switching of the states usually requires a circular magnetic field. 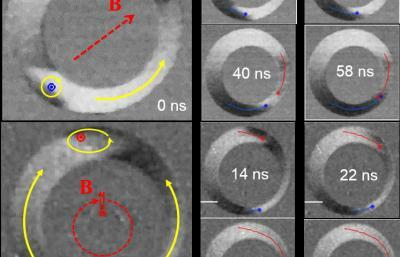 The researchers now devised a way to overcome to requirement - by using slightly displaced holes in the rings (which are thus thinner on one side), which means that a short uniaxial magnetic field pulse can switch between the two possible vortex states.